Complete all modules of the online curriculum including readings, real world practice, written assignments and tests. International Doula Institute is a go-at-your-own-pace program. This means you can take as long or as short as you’d like. Some doulas can finish up the training in as little as one month. Other students take their time and just work on the training at nap time, after bed time, after work or during breaks. This approach enables students from many different walks of life to be able to complete the training. Complete all modules of the online curriculum including readings, written assignments and tests. Submit employer and character references. Undergo criminal background check and child abuse clearance. Submit Proof of CPR Certification. 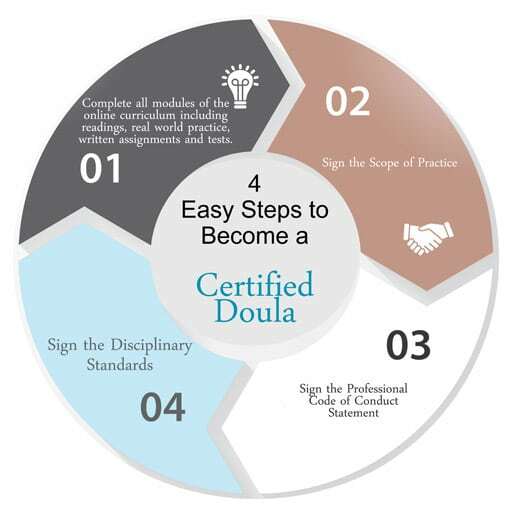 The International Doula Institute uses criterion referenced assessment providing an objective reference standard. This means that examinees are evaluated on how they perform relative to a fixed set of criteria and the test takers own knowledge base and ability to perform his or her duties as a postpartum doula. Our certification exam includes multiple choice and open-ended questions, however we do not rely only on those methods in our examination. Programs that rely on traditional methods of examination alone promote memorization of facts rather than retained applicable skill. The inclusion of these traditional methods of assessment are important, but we have also included authentic assessment(also called performance assessment) measuring the intellectual and hands-on accomplishments that are worthwhile, significant and meaningful to the work of a postpartum doula. We use authentic assessment to test performance of skills, demonstrate use of a particular knowledge, simulations and role plays.